Sending and requesting for e-money is possible in two places: within a chat during a conversation or during a video call with a contact. Whilst in a conversation, press on the currency sign which is situated on the bottom left side of the screen. 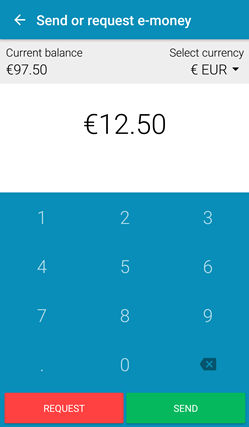 It will open a screen in which you are required to input the amount. Press on Request or Send, depending on your choice. 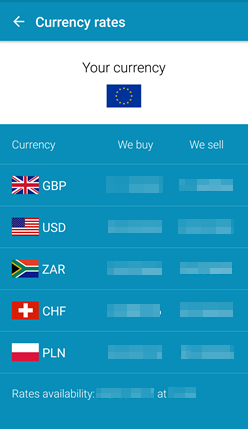 FX transactions: You can send money in any one of the currencies available in the application (CHF, EUR, GBP, PLN, USD or ZAR), no matter the currency of your account or the currency of the recipient’s account. In case the transaction is not a same-currency transaction, exchange rates are involved; these are established by Moneymailme application. 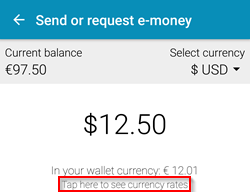 Exchange rates as sender: If you want to see the exchange rate used when transferring an amount in a currency different than the currency of the account, in the transfer page, press under the amount to see the currency rates applied to the transaction. Exchange rates as receiver: If you want to see the exchange rate used when receiving an amount in a currency different than the currency of the account, in the Transactions page, see the details of the transaction for the transfer amount (in the original currency) and the received amount (in the currency of your wallet). If you Request for e-money, a message appears in your conversation confirming your request. Option 1: If your request is denied, you will see the denial message in your conversation. Option 2: If your request is approved, you will see a confirmation message in your conversation and you will receive an email confirming the incoming transfer. As a consequence, your Moneymailme wallet balance is updated in the mobile main menu. If you receive a Request for e-money, a message appears in your conversation in which you can choose to deny or to approve the request. Option 1: If you deny the request, the denial confirmation appears in your conversation. Option 2: If you approve the request, the security code is required to authorize the transaction. You will see a confirmation message in your conversation and receive an email confirming the incoming transfer. As a consequence, your Moneymailme wallet balance is updated in the mobile main menu. If you Send e-money, the security code is required to authorize the transaction. A message will appear in your conversation confirming the transfer and an email will be sent to your account to confirm it. As a consequence, your Moneymailme wallet balance is updated in the mobile main menu. If you Receive e-money, a message will appear in your conversation notifying the received transfer. Also, an email will be sent to your account to notify you about the action. As a consequence, your Moneymailme wallet balance is updated in the mobile main menu. Note: E-money transfers are transactions on your wallet. See Transactions section for more details.